Place shrimp on a small rimmed baking sheet. Sprinkle with 1/2 tsp cajun seasoning, lemon juice (or vinegar), 1 T oil (if using) and pinch or two of salt and black pepper. Place in the oven on the upper third rack. Broil for 3-5 minutes until shrimp is completely opaque and pink. Meanwhile, place cucumber slices in a bowl and toss with remaining 1/2 tsp cajun seasoning, 2 T vinegar, 2 T olive oil (if using), and salt and pepper to taste. 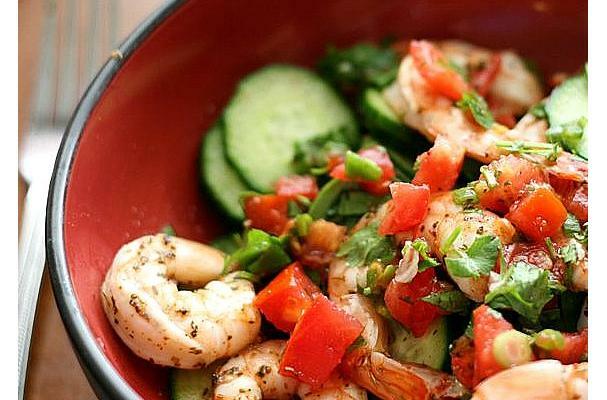 Divide cucumbers between two bowls, top each with half of the shrimp and a couple spoonfuls of pico de gallo.